Facilities are big and heavy with steel and concrete but they are also packed with data that is like gold. If you work on the planning, design, construction or operations of facilities this is a must see webinar that shows you how to maximize the value of the data you produce. Owners are starting to formalize how they communicate their needs to the building industry in machine readable data that flows into BIM. This process applies to all building types. See how it is being used on higher education, healthcare, government agencies, transportation and more. The webinar will also have an introduction to how steel, concrete, wood and data are driving the USA Pavillion at Expo 2020 in Dubai. At the Airport Planning Design and Construction Symposium on March 1, 2018 in Denver Colorado, the audience participated by submitting BIMs in real time for planning an airport. The results of the exercise will be presented in this webinar. Stovepipes in the AECOO industry are choking innovation and in one word, it’s “BAD”. In our ever-expanding interconnected world, platforms are enabling innovation at an exceptional pace. It’s time to break bad and build AECOO platforms that eliminate silos. Owners of large, complex facilities like hospitals, federal agencies and higher education are taking control of their institutional knowledge and using the latest technologies/processes, to optimize stakeholder access to information/data. This unprecedented move has set the stage for industry partners to work together and dramatically improve efficiency while providing value back to the owners. What once took weeks or months of manual collecting, entering, transforming and converting project requirements in to BIM, GIS and FM, now happens in seconds or minutes — and is accessible immediately. This platform to drive the total asset lifecycle of information, benefits owners, while letting consultants provide better and new types of services directly linked to the owners’ data. ​At the Construction Users Round Table conference on Feb. 14, 2018, Breaking Bad was presented and the audience participated by submitting BIMs in real time. See the results of that exercise in this webinar. ​Stephen Hagan, Michael Chipley and Kimon Onuma kick things off with a conversation about AEC Game Changers, BIM, cybersecurity, and data driven decision making. Learn about how this BIMStorm will engage the industry and how you can participate and learn. Jim Bedrick, Mark Giuliani and Kimon Onuma present: how AEC is changing, examples from other industries, and progress on the San Jose Airport BIM. Sign up for future webinars to get access to this recording. Deke Smith and how Total Cost of Ownership and the entire life cycle applies to all project types. Update on the progress of San Jose Airport. 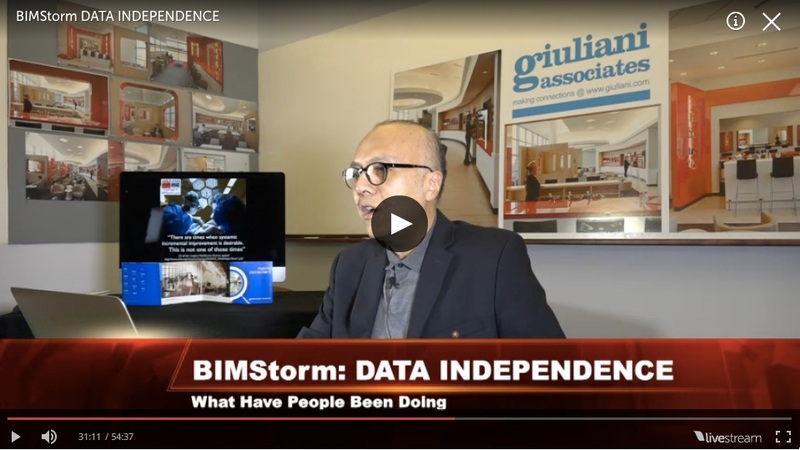 An alternate livestream version is available with footage of Kimon Onuma presenting the BIMStorm Data Independence introduction. ​Thanks to ARCH-i-TECH.TV for producing and streaming this video and for Giuliani Digital for hosting the broadcast from their Alexandria, Virginia office.